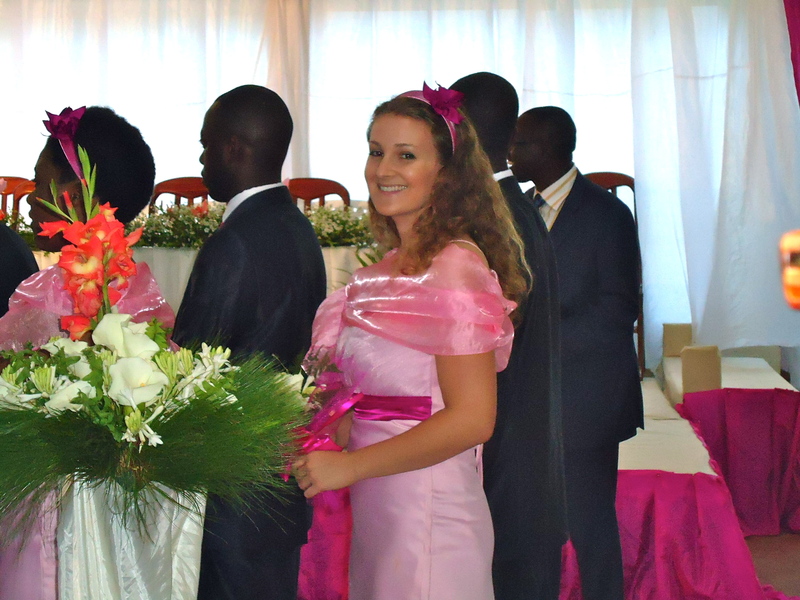 As I mentioned in an earlier post, Rwandan weddings have three parts: a traditional introduction ceremony, a religious church ceremony, and a civil ceremony. Last month, I was a bridesmaid for my neighbor Janet’s traditional introduction ceremony to her fiance Vedaste and this past weekend I had the honor of participating in their religious ceremony, again as a bridesmaid. 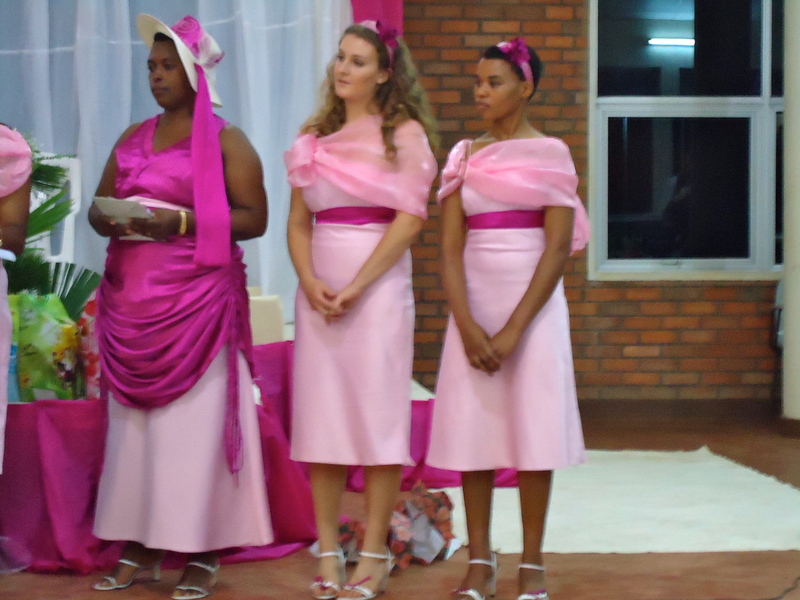 At this ceremony, bridesmaids wore more modern garb instead of the traditional mushanana. The color theme of the wedding was pink: the bridesmaids’ gowns, groomsmen’s ties, decorations, champagne, cake, and even the napkins were all shades of pink. 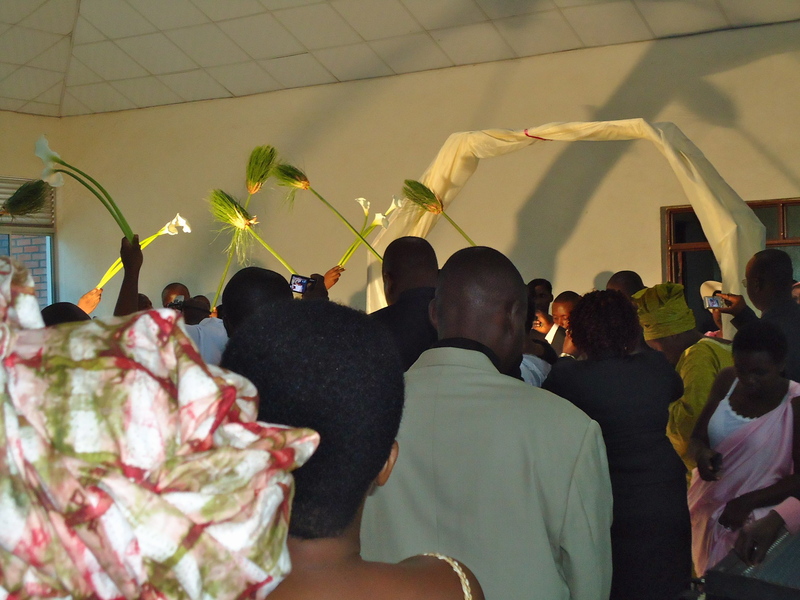 The church ceremony, held at Janet’s Pentecostal church, was quite dynamic with a lively chorus and a priest preaching exuberantly in Kinyarwanda. After the ceremony, it is the custom here for the bridal party to travel to the reception in a caravan of SUVs decorated with ribbons (in this case, pink). At the front of every wedding caravan is a pick-up truck with a camera man filming the whole procession. Before entering the reception area, the bridal party and later the entire family participated in a photo shoot outside. After photographs of every permutation possible were taken, the guests entered the reception hall and awaited the bridal party. Janet and Vedaste entered through a formation of bridesmaids throwing flower petals, groomsmen holding cracklers, and family members creating a canopy of calla lilies. Janet, her husband, Vedaste, and a chicken. After the reception the bridal party and some of the guests drove to the couple’s new home for the last ceremony of the day, called “gutwikurura.” It is the tradition here for the woman to leave her home to move in to her husband’s house the very day of the marriage. He is expected to furnish the home completely and she is expected to bring household goods (like the wedding presents, rice, garbage cans, etc.). 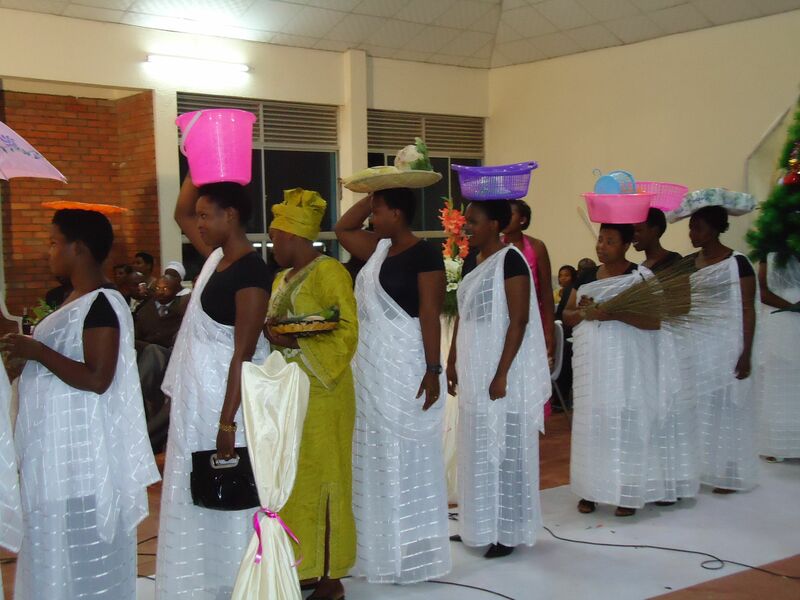 Gutwikurura is the ceremony in which family members and friends come to the house to congratulate the newlyweds and bring them food and presents in traditional Rwandan baskets (“ibiseke”). 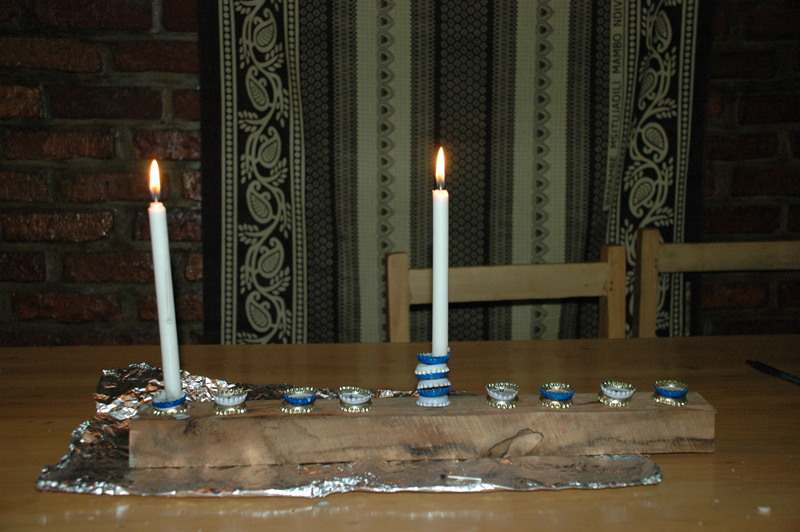 Also at their new home the evening after the wedding, the couple respects other rituals that have evolved over the years. I was told that in the past, wedding guests waited while the couple consummated the marriage to find out if the woman was a virgin. That is thankfully no longer the case (at least not in Kigali – I think it may still happen in the some rural parts of the country). 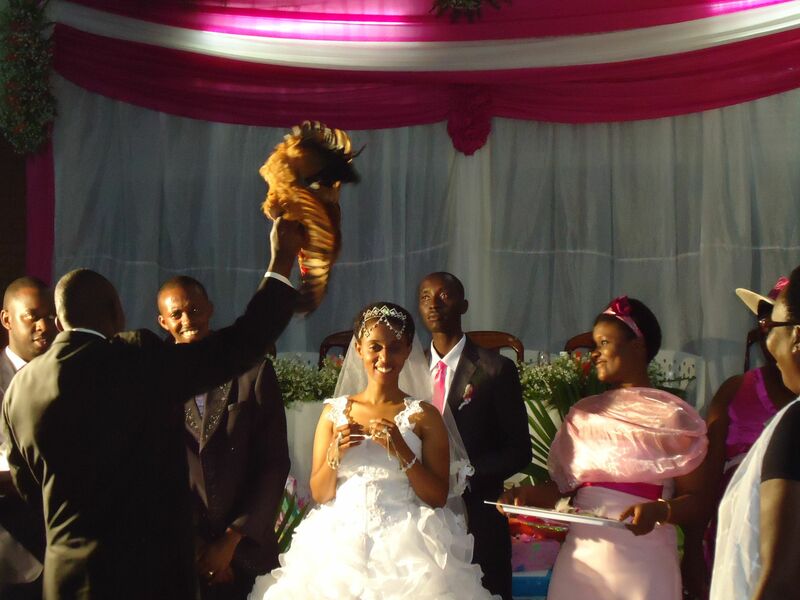 Some variations on the wedding evening rituals include the man cutting a piece of his wife’s hair to symbolize that she belongs to him, a young bridesmaid being given to the bride as a symbolic little sister to help out for a few days, an aunt or godmother putting a mosquito net over the couple to symbolize their union, the man chasing his wife around the house, and more. It’s been quite an experience to participate in all of Janet and Vedaste’s wedding festivities and I really appreciate having such an intimate lens into Rwandan culture. With the wedding season dying down, I guess I’ll have to find other activities to fill my Saturday afternoons! Along some streets in Kigali, I witness a very disturbing phenomenon at least a few times a day: dazed and shoeless street children – called “maybobos” in Kinyarwanda – roam aimlessly, holding bottles of glue under their nose that they inhale, essentially for survival. I would estimate that the children, all boys, range in age between 8 and 16, although it is difficult to discern individual ages because their growth has been severely stunted. A group of these children spend their days and nights sniffing glue and begging on the streets of Nyamirambo, the area that is considered the poorest part of the city (where I live). 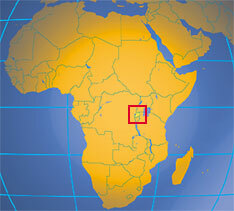 Some can also be found in the center of town, near the taxi parks and industrial areas. As one AllAfrica.com article discusses, street children like these often sleep in groups for security and emotional and social support. Social workers who take care of Kigali’s street children estimated their numbers as high as 6,000 in 2004 and I would guess that number has declined significantly to well under one thousand today (largely thanks to an occasionally controversial government initiative to rid the streets of “undesirable persons” by taking them to rehabilitation or retention centers). Many of the older street boys are orphans from the 1994 genocide and the younger ones are most likely victims of social and economic vulnerabilities typical of capital cities in developing and post-conflict countries. The glue that these street children sniff is mostly shoe repair glue, which is readily available, cheap, highly addictive, highly toxic, and extremely powerful because of the neurotoxin toluene. Many of the glues available over the counter here are either illegal or require a license in developed countries. There have been a few cases of socially responsible glue companies like Testors who, upon learning how their products were being abused, introduced a noxious chemical that made their solvent-based adhesives impossible to inhale without immediately vomiting. Unfortunately these safer non-addictive alternatives are often ten times the price of their addictive counterparts. As an online forum on glue sniffing in Nicaragua discusses, “The glue is inhaled, not as some assume, because the sniffer merely wants “a high”. The fumes reduce one’s concept of reality, minimize fear, and nearly eliminate pain. The glue is usually, at least initially, sniffed to elleviate hunger pains, or and/or to tolerate cold weather or other physical ills.” This is definitely the case for most of the glue sniffing children in Kigali, who are all extremely skinny and dressed in tattered clothing like clearly donated American t-shirts and ski jackets. Once addicted to sniffing glue, which happens fairly quickly, users experience not only suppression of pain and hunger but also a boost in confidence, reduced social concern, and reduced physical control. Glue fumes give a temporary intoxication with hallucinations that can lead to either good “high” feelings or nightmarish depression. This explains why some of the street children I encounter are often singing, dancing, frolicking, darting across busy streets, shouting nonsensical exclamations, or attempting to engage in petty thievery. Long term effects of glue sniffing include liver and/or kidney failure, permanent brain damage, and early death. Some children around Kigali have devised clever ways of positioning the glue containers so that they don’t even have to hold them to sniff the fumes, like tucking bottles into their shirt collars. One of the more disturbing sights I’ve witnessed was a young child sitting at a bus stop who had tied a glue bottle to a pole behind him so that he could sit on the bench and inhale like a horse with its feed bag. Unfortunately the problem of glue sniffing among street children is not unique to Kigali. Along with gasoline sniffing, it happens in many other African cities, as well as most cities around the world where there is extreme poverty and concomitant desperation. I remember seeing little plastic bags discarded along the streets of Managua, Nicaragua as signs of the pervasive issue of glue sniffing there too. Fortunately, there are some organizations working to alleviate this issue by providing support to street children in Kigali. Two of them are Street Kids of Rwanda and Centre Marembo. Here is an excellent opinion piece written to the Rwandan newspaper The New Times about the need for people to take this problem seriously. Seeing young children whose tragic existence is both tortured by and dependent on sniffing glue is not something I think I’ll get used to.